Description: Classic FTP Free helps maintain your website by uploading and downloading files quickly and efficiently. Classic FTP secures file transfer by using FTP SSL security. Classic FTP Free for Mac is compatible with all popular FTP servers. 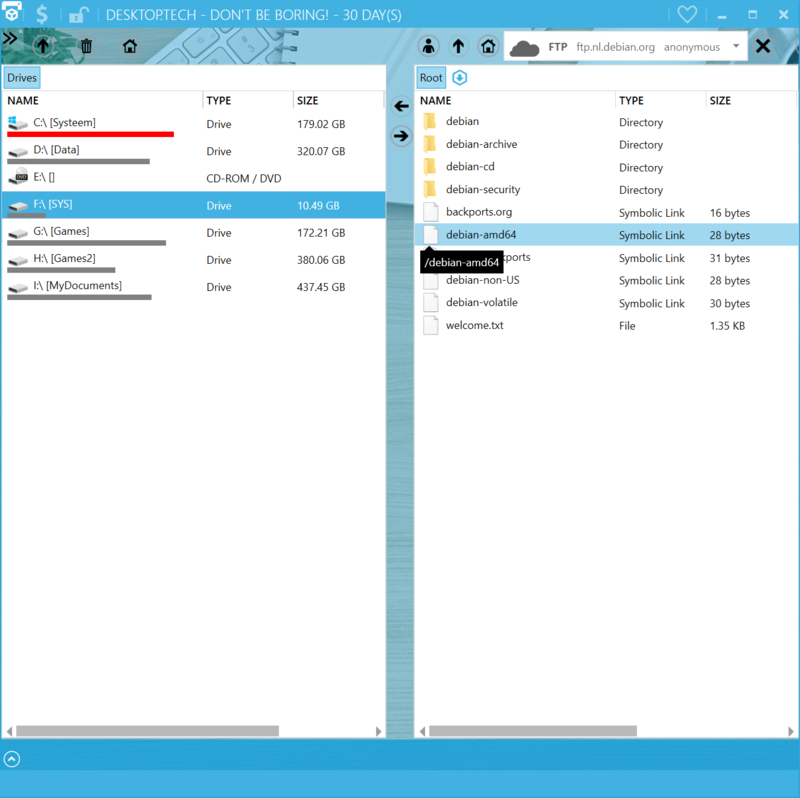 Use the synchronization tool to check local and remote folders for the most updated files. 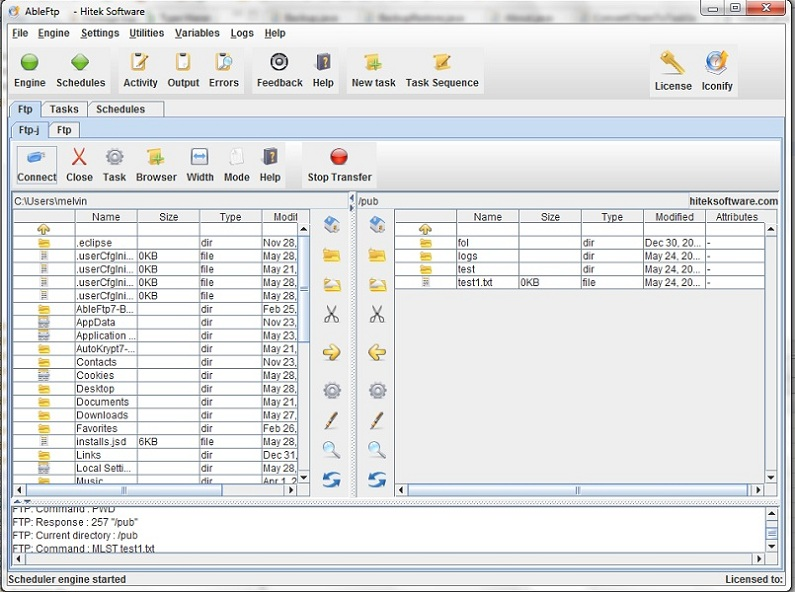 Easily drag and drop files within the user interface. 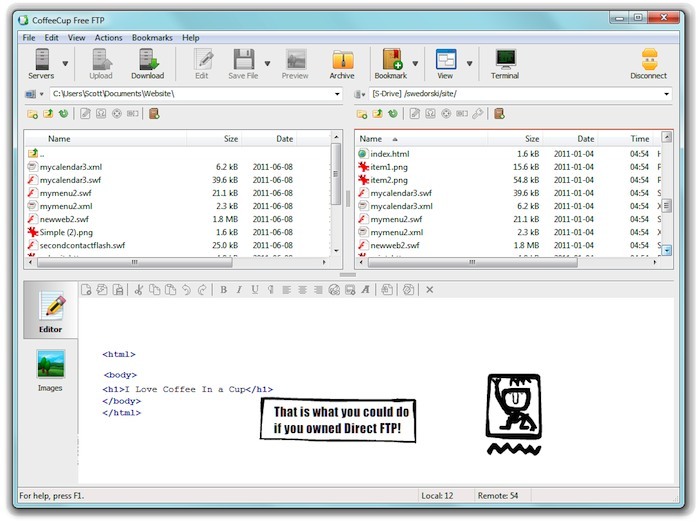 Description: Classic FTP is a free FTP client that allows you to upload, download and delete files from a remote server. "Mirror and Upload" tool to scan a selected local folder and upload any files that do not exist in the selected remote folder. It also features the ability to synchronize navigation of local folders with remote folders to reduce the risk of uploading to the wrong folder. Supports FTP via the Internet, local network and external hard drives. Description: Classic FTP is an easy to use ftp client that allows you to view, edit, upload, download and delete files from a website or network for free. 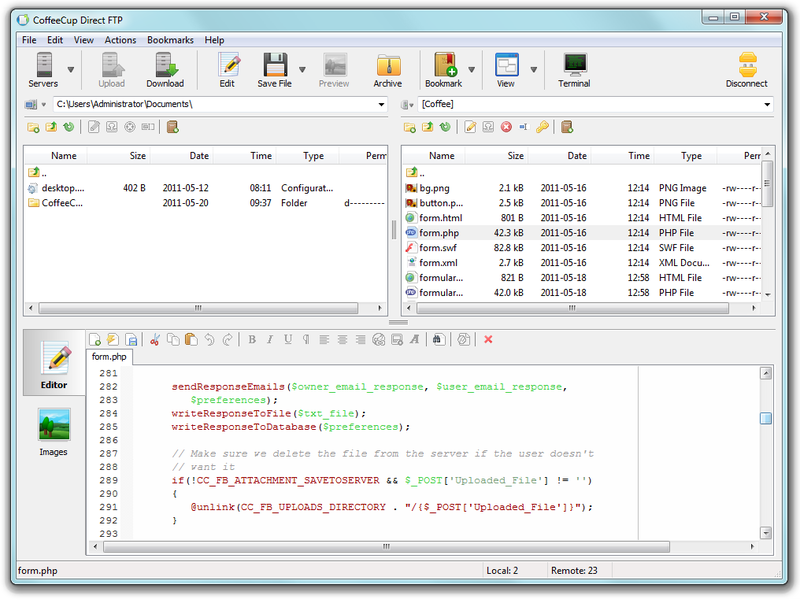 As its name suggests, Classic FTP has been specifically designed to look and feel like a typical ftp software client. Whilst offering all the same features as other ftp clients, Classic FTP is perfect for both advanced and novice website administrators. Description: Classic FTP Plus for Mac is an easy to use ftp client that allows you to view, edit, upload, download and delete files from a website or network. As its name suggests, Classic FTP has been specifically designed to look and feel like a typical ftp software client. Whilst offering all the same features as other ftp clients, Classic FTP is perfect for both advanced and novice website administrators. Description: Webmasters love Direct FTP because it's so easy to make quick changes and updates to their Websites. Just drag a file to the Edit window to make changes and click save when you are done. Direct FTP saves the changes directly to your Website! Preview images right from the server too! One of the best features is the ability to make a backup ZIP file of your Website with just one click. Description: CoffeeCup Free FTP is a fast, no-frills FTP program that makes it easy to drag and drop files to and from your Website. It supports multiple server profiles, resumes broken uploads and downloads, and can transfer files in binary, ASCII, or auto-mode. Free FTP works with any server and is so easy to set up. Just enter your username and password and click Connect. Free FTP remembers your server information, so reconnecting to your site is a snap. Description: CoffeeCup Places brings all your web accounts together so you can access them all in one spot. 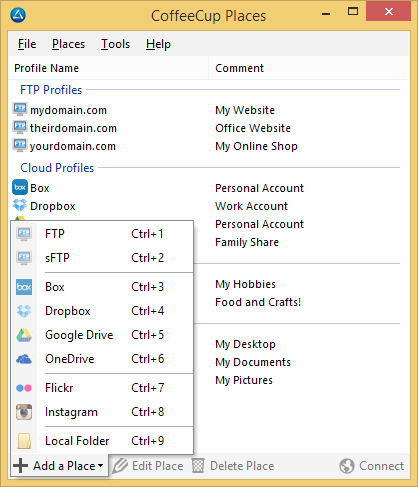 Connect to multiple clouds, social media and FTP accounts to seamlessly upload, download and share files between them all. With everything under one roof, you'll simplify your web life. Description: Desktop.Tech is the Swiss army knife of desktop applications! Upload and download from FTP, SSH/SCP and Amazon S3 servers. In the future more protocols will be added! You can explore your harddrive with the internal Windows Explorer replacement. Search your harddrive with an lightning fast index-based system. Desktop.Tech is available in 4 languages (and growing! ).